Kotaro Kiyomiya of Waseda Jitsugyo singles in a run in the seventh inning. The Yomiuri Shimbun NISHINOMIYA, Hyogo — First-year phenom Kotaro Kiyomiya made a mark in his debut at Koshien, delivering an RBI single in Waseda Jitsugyo’s 6-0 victory over Ehime’s Imabari Nishi in their first-round game Saturday at the National High School Championship. “Koshien is far more special than any other ballparks I’ve played,” 1.84-meter slugger, son of ex-rugby star Katsuyuki Kiyomiya, said before the game. In his first and third at-bats, Kiyo-miya flied out on high pitches. He got hit by a pitch in his second appearance. But in his fourth trip to the plate with a runner on second and one out, the left-handed hitting Kiyomiya drilled the first pitch he saw, an inside high offering, between the first and second basemen. 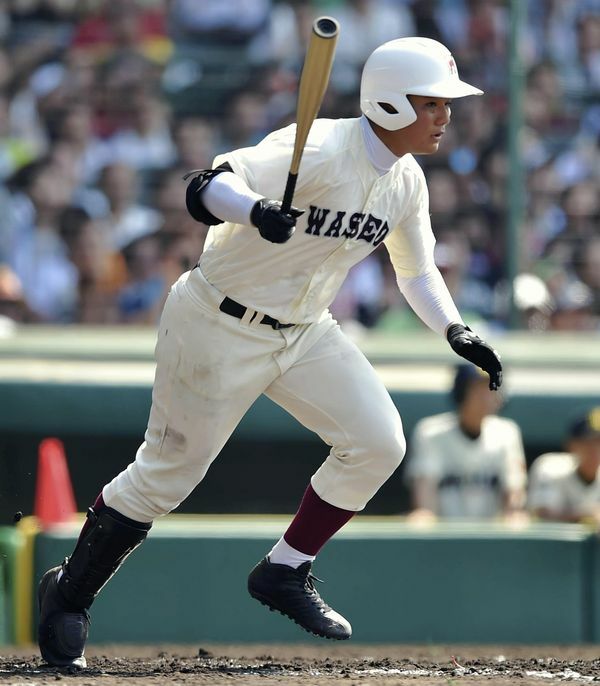 That thrilled the crowd of 47,000 at the venerable Koshien Stadium and widened the West Tokyo school’s lead. In the earlier at-bats, the Imabari Nishi pitchers threw tough inside pitches. Thus, “I was waiting for an inside pitch. I had a good swing on an easy inside ball,” Kiyomiya said.